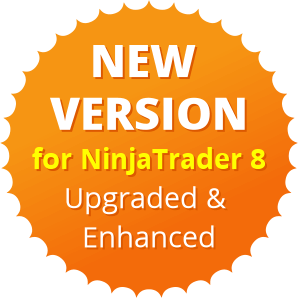 Are you tired of deciding how and when to enter trades using outdated methods, inaccurate indicators, or guessing? The Atlas Line trading software tells you exactly how and when to enter by plotting either a Long or Short entry signal at the moment you should enter. You will know exactly when to buy or sell the market AHEAD of big moves. These signals are very accurate and can be used as a standalone trading system or in combination with our other strategies. The plotted line provides you with a constant reference of how you should be trading (either Long or Short). When price is above the Atlas Line, stay Long. When below, stay Short. It's that simple. 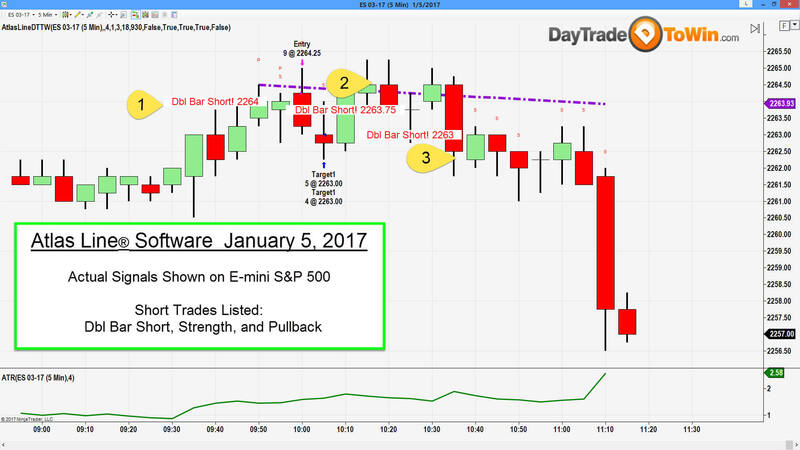 Additional potential profit-taking setups are identified by the trading software's Strength and Pullback signals. These are the small S and P letters you have probably seen in our trading videos. These opportunities appear after the initial Long or Short move. The Atlas Line trading software produces multiple Long and Short signals based on its proprietary algorithm. The line and generated order signals provide an indication of which way the market is expected to move. Instead of using multiple time frames or complex systems, use the Atlas Line to clear up inaccurate and conflicting signals. You can also use it as a filter for other strategies. Get either the Lifetime License or the 6-Month License. 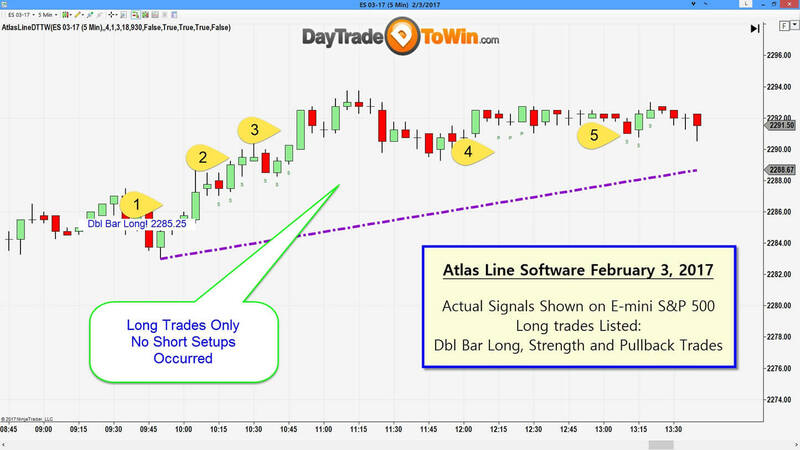 Currently, the Atlas Line is available for NinjaTrader, TradeStation, and eSignal. For your platform of choice, we can license up to two computers you own. After purchase, you will receive the download link. We will activate your Atlas Line shortly thereafter and contact you regarding the live training session. Free live training is included with purchase. John Paul will personally show you how to configure and trade the Atlas Line. Learn to identify the setups and the exact profit targets and stops. Your live training session will be recorded, so you can log in and play back the recording in the future. Remember that email support is also included. We can also assist with installation via remote support. "I have been trading the Atlas Line for about 3 weeks using Dbl. 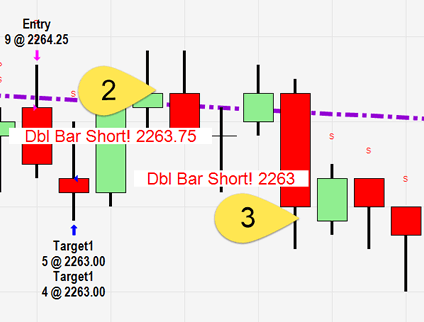 Bar entries to start then the pull backs and strength trades throughout the rest of the session. I have had 90% winners to this point, keeping track of every trade. 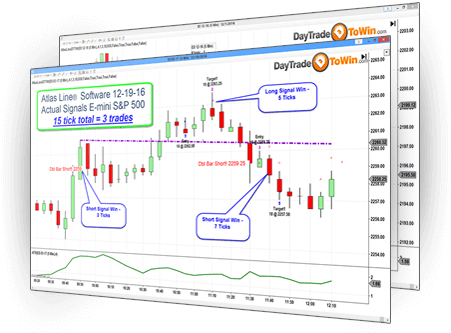 Best system I have seen thus far for electronic trading..."
What is the Atlas Line day trading software and how will it improve my day trading? This is the most common question that I receive from day traders. The Atlas Line, a proprietary trading indicator, was developed for professional trading firms. Now available publicly, the Atlas Line provides a great advantage over other trading systems (and traders) because of its unique ability to produce Long and Short order signals prior to major price movement. Knowing that you can rely on one indicator to improve your results puts you at an advantage over other traders who believe "more is better." The Atlas Line indicator provides everything you need for consistent success: when to enter the market and how to enter (Long or Short). Does the Atlas Line only work on the E-Mini S&P 500 or can it work on other futures, the Euro and other currencies? One of the best features about the Atlas Line trading software is the fact that it can be used across many types of markets. I prefer futures and currencies, as they traditionally offer great volatility. It's best to avoid markets that move slowly. The E-mini S&P works particularly well for day trading. It's my preferred market. 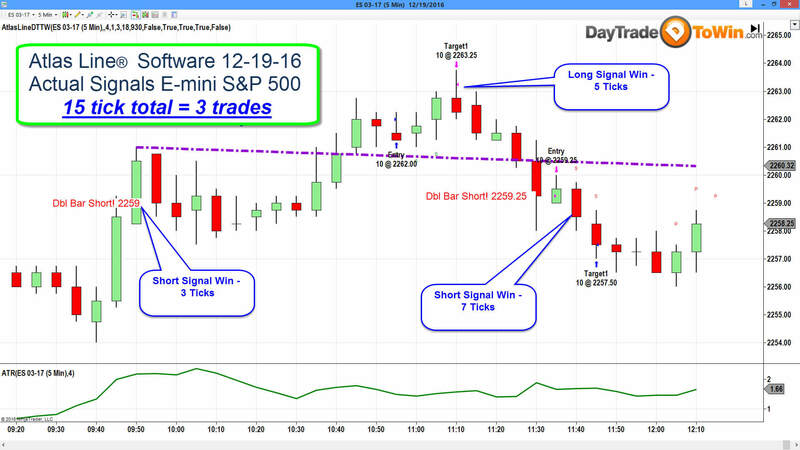 Generally, futures markets offer plenty of intraday opportunities. Currencies such as the Euro FX (6E), British Pound (6B), and the Australian Dollar (6A) also perform very well on a regular basis. Additionally, energy markets such as Light Crude Oil (CL), metals like Gold (GC), or other markets like Bonds (ZB) and the Dax (FDAX) also work very well with the Atlas Line. Does the Atlas Line software confirm long or short entries in real-time as a leading indicator? Does the Atlas Line software display orders to enter the market Long (buy) or Short (sell) on charts with exact price entries? What day trading software platforms are compatible with the Atlas Line? The Atlas Line supports the following trading software: NinjaTrader, TradeStation, and eSignal. If your preferred platform is not listed, please let us know via the contact page. After purchasing, let us know the platform you want to use. Licenses are provided for one platform only. Is the Atlas Line a price action indicator? Yes, the Atlas Line utilizes only price in its calculations. Because only price is used, there are very few parameters to configure. Normally, indicators require additional configuration steps (on a per market or per time frame basis) because they rely on other data besides price. What kind of trades can I expect with the Atlas Line? The Atlas Line produces multiple Long and Short trading signals on a daily basis for each market you trade. 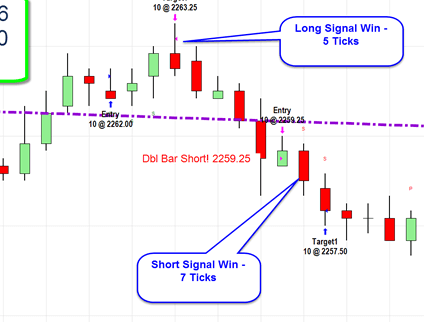 In addition, there are two unique trading signals (Pullback and Strength) generated according to the price action of the market. 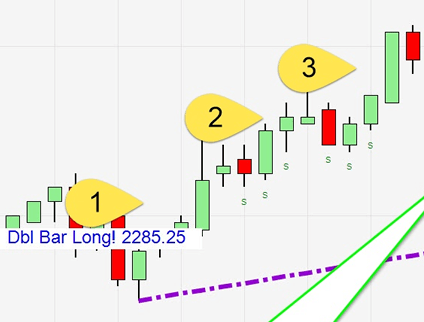 In NinjaTrader, a Long signal on the E-mini S&P would appear on your trading chart as the text "Long 1205.25". As a price action indicator, the Atlas Line does much more than provide exact charted entries. Other indicators may experience latency (aka "lag") whereas the plotted Atlas Line maintains a static direction. Can the Atlas Line be used in conjunction with other indicators or trading methods? Yes, the Atlas Line can be used for filtering trades, used with an existing scalping method (as the Atlas Line can help determine trends), and the Atlas Line can also help confirm entries for your own trading strategies. Before you enter the market, confirm the trade based on the Atlas Line. For example, if you are about to enter the E-mini S&P Short utilizing your own strategy or method, see if your thinking agrees with the relationship between price and the Atlas Line. This alone may prevent losing trades that you would have otherwise taken. Remember that if you enroll in the Mentorship Program (a separate product), you receive a Full Atlas Line license in addition to the nine or so other trading methods. By visiting this site, purchasing or using products offered by Day Trade To Win, you agree to the following Terms and Conditions. All sales are considered final due to the nature of software licenses, digital downloads, live instruction and proprietary methods taught. No refunds. Day Trade To Win has the right to refuse any customer for any reason. All instruction, signals and advice supplied by Day Trade To Win representatives or software is to be used at your own risk. Day trading is inherently risky, as it involves unlimited profit and loss. Day Trade To Win cannot be held accountable for any loss or other financial damages. Course material may not be resold, transferred, duplicated, copied or shared in any way (digitally or physically). Such sharing is subject to criminal penalties and terminates all licenses you hold with Day Trade To Win. Agreeing to these Terms and Conditions also concedes agreement to the U.S. Government Required Disclaimer and CFTC Rule 4.41 listed below. Get invited to the next live Atlas Line webinar.